Known as “The City of Eternal Spring” because of its climate, sun time, and the local’s chipper attitude, the city of Trujillo is the capitla of the northern La Libertad region. Centuries ago, the region was under the reign of one of Peru’s most important pre-Inca societies: the Mochica. Among the principal monuments, the Sun and Moon sacred sites exemplify the richness of Monchican culture. The Mochican culture famed for its “huacos,” which means holy land in Quechuan, flourished and existed between the first and fourth centuries. They built the clay city of Chan Chan, and their main structures were the Huacas of the Sun and the Moon. The holy sites were important high-society and religious sites respectively. The Sun Site was erected in a pyramid style and reaches a hight of approximately 43 m (141 ft). Experts of the ancient culture believe that the Mochican elite resided on the Sun site. Today, visitors can appreciate the five terraces of the Sun Site which are presumed to have been recreational spaces for the the site’s residents. About half a kilometer away (a third of a mile) from the Sun Site is the Moon Huaca . The Moon Site was a ceremonial and religious center for the Mochican culture. At a hight of 21 m (69 ft), the site is made of several temple-like structures built on top of one another and during different time periods. 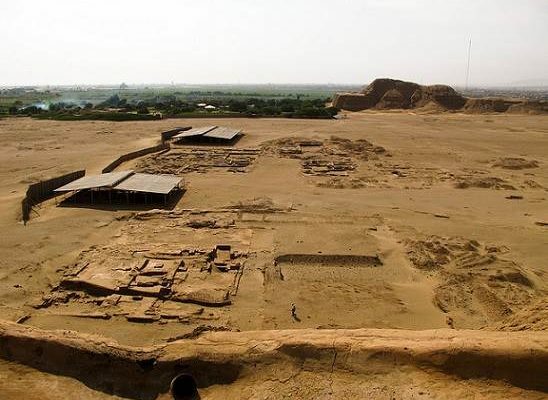 Because of the archeological finding of 40 sacrificed warrior in front of the Moon Huaca, the Mochican culture is widely believed to have been a culture that valued war and honor through sacrifice. At this site, black, white, red, blue, and yellow colored murals are scattered throughout and within the Moon Site and represent Ai Apaec which means “the executioner god.” The murals further suggest that these ancient people’s culture was a warrior’s culture; and Ai Apaec is also found painted around the city on avenues, alley ways, plazas, and corridors. The Sun and Moon holy sites are 15 minutes from downtown Trujillo. Before reaching the sites, you will need to traverse the Mochican fields were today’s local villagers use the land for agricultural and artisanal means. At the Huacas of the Sun and Moon, guides perform thorough tours of the sites. The excavation zone tour and the explanations of the archeological process are the highlights of tours. Tours are usually an hour and a half long. Moche Tours Trujillo is a tour agency that specializes in the Sun and Moon holy sites. Accredited by the Peruvian Ministry of Commerce and Tourism, and aside from offering tours to the Huacas, the agency also provides transportation into and out of the sites, tours of the ancient city’s wonders, treks through the Mochican agricultural fields, and a journey into the Mochican artisanal center and style. One of the best hotels in Trujillo is Hotel Libertador Trujillo located in front of la Plaza de Armas. The hotel itself has a colonial architect style, internet access, a pool, a gym, a sauna, a bar named Malabrigo, and the restaurant Las Bovedas. At the restaurant, try the seafood cocktail cibiche mixto, the wheat and smoked pork soup shambar, and the house special Robalo a la plancha, a grilled fish cooked with mushrooms and algae. As to not to ruin your archeological dive into the ancient Mochican culture, don’t forget the sunscreen, light clothing, sunshades, and sun-blocking hats. Enjoy!